The City sends snow emergency alerts via email, text message, and/or phone announcements using the CodeRED system. This service will be used for snow emergencies affecting the City as well as evacuations, large-scale water outages, and other significant weather events and service disruptions. During substantial storms, the City may declare a Snow Emergency Parking Ban which prohibits parking on streets signed "No Parking during Snow Emergency" (view interactive map). When a snow emergency is declared, information is made available at 617-349-4700, the City's homepage and snow center, and on 22-CityView. To receive notifications about snow emergencies via e-mail, text message, and/or phone announcement (for any landline or cell phone in the city or elsewhere), sign up for CodeRED. Every effort is made to give residents as much advance notice as possible of an impending snow emergency. Enter your address to find the nearest location offering off-street parking during a declared snow emergency parking ban. This information is provided by the MBTA/Bluebikes and only displays weather-related delays. The City's Public Works Department will clear City streets and sidewalks as soon as possible. The department's goal is to chemically treat all major arteries within three hours of when snow begins, to keep main arteries plowed during all stages of a storm, and to clear all streets and the sidewalks bordering City property once a storm has stopped. Public Works clears over 23 miles of sidewalk areas including those around schools, public buildings, parks and high volume bus stops. Priority areas to be cleared are those areas surrounding City buildings, major squares throughout the City, and sidewalks and pathways surrounding City parks. When possible, Public Works crews will work to widen streets, increase sight lines at corners, and improve access for pedestrians, cyclists, and vehicles. Please remember to share the roadway, go slow, and use extra caution to be aware of pedestrians, cyclists, and vehicles. Objects left in on-street parking spaces may be removed when crews are available after a snow event or when a snow emergency has been lifted as it is illegal to ‘reserve’ cleared parking spaces. Please clear snow to curb so that collection crews can access your trash barrels and recycling toters and they are not behind snow banks. Please also help make streets and sidewalks accessible for all pedestrians during winter by removing snow and ice and reporting unshoveled or icy sidewalks. If you are able, please do your part to shovel out fire hydrants and clear catch basins of snow and debris. Together, we can keep Cambridge a safe and walkable city all year long. How soon do residents/businesses need to remove ice and snow from sidewalks? Ice needs to be removed within 6 hours from the time it forms, per City Ordinance. Snow needs to be removed within 12 hours after snow stops falling during the day and before 1pm if it snowed during the night, per City Ordinance. The fine for failing to comply with the City’s sidewalk clearance ordinances is $50/day for each day of non-compliance. Even if you aren’t around, it is your responsibility to ensure someone clears sidewalks and ramps next to your property. We all have a shared responsibility for keeping our community safe and accessible during winter weather. For you, your neighbors, people with strollers or using wheelchairs, and the many people in Cambridge who walk, please do your part. The City provides salt barrels in several locations throughout the City for residents to use. Please take only what you need. Am I required to clear my sidewalk if I am elderly and/or have a disability? If you are a homeowner on a low income and are elderly or have a disability, you may qualify for the City’s Snow Exemption Program, in which case the City will shovel your sidewalk. To find out whether you are eligible, please call the Cambridge Council on Aging, 617-349-6220 (voice) or 617-349-6050 (TTY). If you do not qualify for an exemption, the Council on Aging can provide you with a limited list of professional snow removal companies and a list of students who want to earn money by shoveling – you contact the student yourself and negotiate a price. 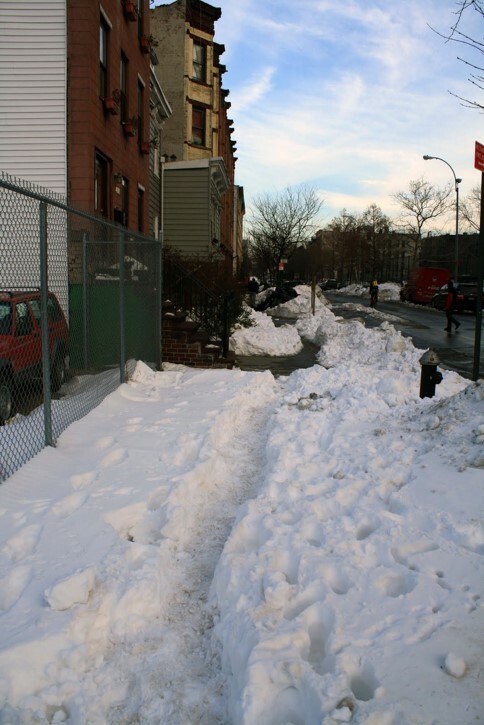 What does a "cleared" sidewalk look like? Shovel your sidewalk and clear it of ice on all sides of your property, down to bare pavement. Make the path wide enough for someone using a wheelchair, walker or stroller (at least 3 feet wide). Clear snow to curb so that collection crews can access your trash barrels and recycling toters and they are not behind snow banks. Clear ramps at corners and crosswalks. Stock up on ice melter before a storm. Use ice melter with calcium chloride (CaCl2), which is the best choice for the environment and only a small amount is required to melt ice. Potassium chloride (KCl) is okay, too. Avoid rock salt (NaCl or sodium chloride), which kills plants and trees. Do not use sand. It doesn’t help pedestrians; but it makes hard ice more slippery. It gets into street drains and is expensive to clean up in the spring. Consider helping neighbors who may have difficulty clearing their walk. 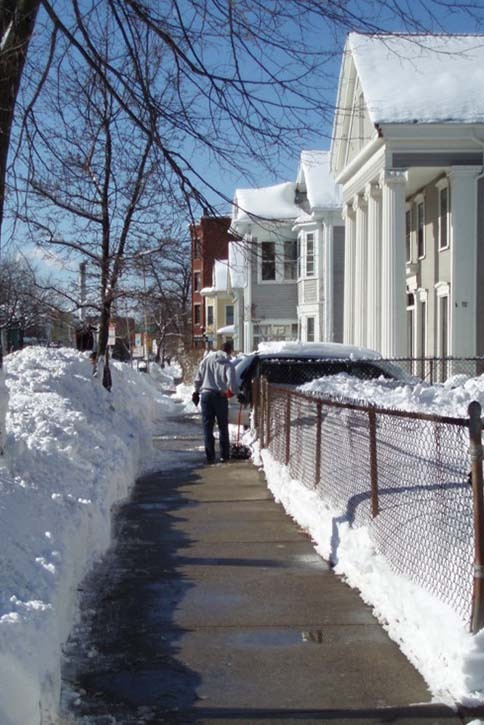 Keeping sidewalks passable is the neighborly thing to do, and it’s the law. You don't know when the next emergency or disaster will occur, so take some time to make a plan of what you and your family will do during emergencies. Your family may not all be together when an emergency occurs, so you should sit down and create a Family Plan to keep you and your family safe. If you heat your dwelling with oil, check to make sure that you have enough home heating fuel to get through the storm. Make sure your heating equipment and/or fireplaces have been serviced by a professional. Install and maintain smoke alarms on every level of your home.Replace the batteries in your smoke detectors when you change the time on your clocks each spring and fall. Remember, if the smoke detector sounds leave your home immediately and call 911. Make sure your carbon monoxide detectors are current and operating properly. If you have medical conditions, make sure you have a supply of necessary medications. To be prepared for a possible power outage, stock up on batteries, flashlights, and canned goods and bottled water. Following the creation of multiple street-level separated bicycle lanes in Cambridge in recent years, the City has gained experience with the installation and maintenance of the separators (often referred to as flex posts) that are installed between these types of separated bicycle lanes and the adjacent travel or parking lane. There are three primary locations where separators are used: In clear zones, adjacent to travel lanes, and adjacent to parking lanes. Use of screw-in separators than can more easily be removed and reinstalled, particularly in the case of a last-minute decision to remove separators. The City has outstanding concerns about the impact the long-term use of this type of separator will have on pavement conditions and will continue to experiment with other options. Installation of additional “flip signs” that allow us to easily create/extend temporary parking restrictions after snow storms, improving the process of snow removal. Creation of special snow removal areas (as has been done on Hampshire Street), where residents are notified in advance that temporary overnight parking restrictions may be needed to accomplish snow removal operations. While we continue to refine our use of these separators based on the lessons learned, our current policy on the installation of separators can be found below. This winter, the Department of Public Works is piloting a program in North Cambridge to treat icy road surfaces using a brine solution of salt and water. A 250-gallon tank in the back of a truck sprays the solution on streets in advance of a predicted storm, creating a layer that prevents snow and ice from bonding with the surface. This process offers protection against ice formation, but uses only a quarter of the salt that is normally used in treating these areas. Instead of seeing actual salt crystals, residents in the Dudley Street neighborhood and along Alewife Linear Park can expect to see faint stripes running down the roadway a day prior to a predicted storm. One of the goals of this pilot is to reduce the amount of overall salt used, but there will likely be times when a brine solution isn’t the most effective option for keeping roads safe. Winter storms and extreme temperatures pose a severe risk to the safety and health of people remaining outdoors. If you are concerned about yourself or someone you see on the street, please contact the FirstStep Street Outreach team at 617-592-6895 or call 911 if it is a medical emergency. If you see downed lines/wires, please report these directly to the Cambridge Police Non-Emergency Line at 617-349-3300. Power outages should be reported directly to your utility company. In case of a power outage, stock up on batteries, flashlights, and canned goods. Avoid using candles during any power outage. If power is lost, unplug all appliances except one lamp to prevent power surge damage. Keep refrigerators closed as much as possible and keep temperature at 45° or below. Food will stay fresh for between 36-48 hours in a full fridge; 24 hours in a half-filled one. Keep a battery-operated radio, extra medicine, blankets, and bottled water on hand. Report power outages to Eversource at 800-592-2000. Use a snow rake for pitched roofs (available in most hardware stores). Try to shave snow down to 2-3" instead of scraping the roof clean to reduce the risk of damage to your shingles/roof. Unless approved by a registered professional engineer, don’t add your weight to the roof when clearing now. Don’t use blow torches, open-flames, or electric heating devices like hair dryers or heat guns to remove snow and ice. Check for open windows, air vents, and wind drafts near water pipes. Seal leaks in the basement foundation where cold air may enter. Stuff holes with insulation. A tiny opening may cause an exposed pipe to freeze. Locate the main water shut off valve in your home and mark it for quick identification. Learn how to turn it off, and educate others in your household. If a water pipe bursts, shutting your home’s main valve quickly will minimize flooding and property damage. Leave kitchen/sink cabinet doors open if pipes are subject to freezing. This will allow heat to reach the pipes. Don’t use an open flame to thaw pipes. If your pipes do freeze, use a hair dryer or rags soaked in hot water to thaw lines. Insulate pipes in unheated spaces like garages, basements, and crawl spaces. This will help prevent frozen pipes, avoiding property damage and the costs of repairs. Additionally, insulating hot water pipes will decrease your wait time for warm water. Protect your water meter from icy drafts and freezing temperatures. Most frozen meters are caused by drafts from an open basement door or window. Double check your property for drafts as the cold weather sets in. More Info from the Water Dept. Heating is a leading cause of home fires in Massachusetts. Use your home heating system and space heating appliances responsibly to keep warm and keep safe. Liquid or gas-fired portable space heaters are illegal in Massachusetts. Use electric space heaters with extreme care; avoid placing them near curtains or other flammable materials and turn them off before going to bed. Make sure all portable heat-producing appliances are unplugged when not in use (irons, hair devices, etc.). If gas and oil appliances and heating systems are not installed correctly, working well, or cleaned and serviced regularly, they can be sources of Carbon Monoxide exposure. Winter is a particularly dangerous time for CO poisoning. Wear sturdy footwear with good traction. Always start your snow blower in a well-ventilated area to avoid possible carbon monoxide poisoning. If you haven’t used your snow blower in a while, remember that gasoline may still be inside from the last time you used it. Gasoline is only good for about 30 days, unless you’ve added a fuel stabilizer. Always make sure that the snow blower is completely turned off before replacing any parts. Fix clogs carefully. If your snow blower becomes clogged, turn it off, and remove the key before trying to clear it. Use a stick and NOT your hands to clear debris. If your snow blower hasn’t been checked up by a professional in a while, have it serviced before you use it.